Oh, how do I start? I love the way Stephanie Perkins write. She has a unique way of telling a story that doesn’t allow my eyes and attention to wander elsewhere, even if I am not overly enthused by the plot anymore. 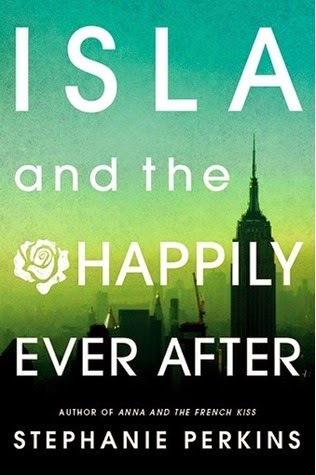 Isla and the Happily Ever After is an enjoyable read, but not the whole book. Still, I like this better than Lola. I liked a lot of Isla-Josh moments, but when I look at the plot I want to cringe. It’s not a very special plot, and even Pekins’s unique storytelling didn’t make me look at it in a different way. It’s just too. . .plain. I cannot decide if I like Isla or not. I like the tone of her “voice”, but I do not like the way she thinks. She is very obsessed with Josh, which got very annoying eventually. I feel like there is no real conflict in this book; the problem is Isla. That’s it. Aside from Isla’s obsession and the plot, I really liked this book. Certain moments swept me off my feet, like that time in Barcelona (best part of the book! ), and the Josh-baring-his-soul-to-her part (intense; I love it that I finally got something intense from Perkins). The part where the other characters from the previous books showed up (Anna & Etienne, Lola & Cricket and Meredith) made me feel nostalgic, and I wanted to stay there in the moment where they were all together. I wanted to put it in a jar and preserve it. They felt like old friends. Isla and the Happily Ever After brought me laughter, frustration, nostalgia, and I-want-to-crawl-inside-the-book-and-live there moments. It’s perfect for a light read, and totally worth a sleepless night.